Detroit: Out of Gas or Out of Mind? Mass media has distracted us from the heart of the matter related to the Detroit bankruptcy. Obviously, Detroit’s financial situation has something to do with the failure of the automobile industry in Detroit, but the automobile industry itself hasn’t completely disappeared from the face of the earth. The oil giants won’t allow it. Therefore, there’s more to the picture than the mass media is presenting. Detroit’s place in the world as an auto giant and home to cars faded long ago when protectionist barriers were placed against fuel-efficient, small, affordable, reliable, dependable, long-lasting cars from Asia, particularly Japan. What I want to address here is the menace of what many will know of in the future as the first corporate buyout of note of a governing body. When any agency or organization declares bankruptcy, the assets are immediately assigned to the creditors. In the case of Detroit, this amounts to corporate lenders and not the public. What’s happening in Detroit is that all of the public assets – particularly the pensions of public employees – are being looted by bankers and lenders, with nothing left for the public of Detroit. While the picture says it all, we have to remind ourselves that we’re still in the early stages where ‘THEY’ are using police as protection while they pilfer public pensions, assets and other sources of economic value. 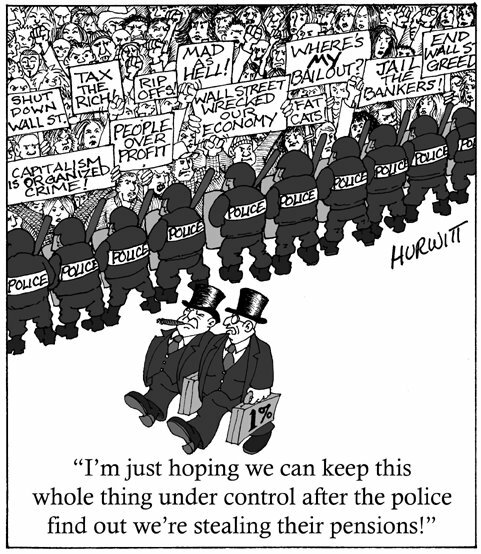 Including those of police forces and retirees. Eventually, the public of Detroit, particularly those that are retired or who are close to retirement, will either discover that the cupboard is bare or be foreclosed on before they can even go to their cupboards. People in their 60s and 70s will be starving on the street and poverty will climb to new heights. The human suffering will be enormous. A likely scenario is that police of any age will likely join mercenary forces that will pay them well to protect the owners of Detroit, but who will beat and abuse those who are the victims of this corporate buyout. It’s entirely possible that within a few years, we’ll all be suffering the same fate, as public pensions – covenants that governments made decades ago with firemen, police officers, doctors, teachers, ombudsmen, councillors and so on – become the first economic assets to be attacked and pillaged in these corporate leveraged buyouts of our governments. Unfortunately, we have run out of time to protect ourselves from the ‘corporatocracy’ that will enslave us all. ‘Robocop’ was a little too prescient in its prediction of the fate of all North American cities. Is there a solution? Maybe, but it’ll take a lot of political will power to make it happen. People in North America need to demand that their pensions be identified as personal accounts and not something to go into a massive pool of reserves, only to be taken by lenders in exchange for interest outstanding. Simply put, this means we should be given the right to put our pension in our own name. It would be transferable to any organization we work for and be available when we hit a certain age. The liability of pensions would no longer be carried on the books of thousands of companies around the world, but on our own bank and personal financial statement. Some restrictions would have to apply to what we could invest in. I would ban options and futures from Personal Pensions, but what do I know? Another more radical option is to look at ways we can default intentionally on loans collectively and on a massive basis so that the debt collectors and their thugs won’t have anything to take. This is fantasy, but worth putting on the table nonetheless. If we don’t engage in serious discussion about the debts our governments have created, expect a LOT of wealth to be wiped from the books and transferred from us to THEM. Global Research wonders on their web site if Americans have been subject to a coup d’etat. Read more here. By all conditions and/or measurements, it’s hard to say no. The Biggest Story Everyone Missed? Stephen Harper and Jim Flaherty seem to be playing 3 shell monte with Canadian taxpayer funds and the budget of Canada. If this is true, they should be thoroughly audited and they should be jailed. Exhibit A: the Department of Defense can’t spend all of the money that’s been allocated to it. The details of this article are light, but shocking. Apparently, DND has about $10 billion in slush funds kicking around. More surprising is the fact that many other departments apparently have billions of funds in reserve for a rainy day. And what rainy day will that be? How about election budget 2015? Expect Jimbo to pull a magic surplus out of his mega-deficit hat, liked a burned-out Burt Wonderstone pulling off a genius ‘last gasp’ effort where (spoiler alert) the only way he can do it is to drug the masses. Exhibit B is even more distressing: the Cons seem to have created Al Capone-style double-book cooking when it comes to tracking and reporting outlays for big-ticket items like the F-35s that no one wants (or can use). Once again, this all points to a convergence of ‘final’ numbers that will have all of the crooks in the Harper cabinet shouting ‘TA DAHHHH …’ as they hit the trail in 2015. Scary stuff folks, because at least a third of Canadians are going to fall for it. Let’s hope the rest of us have our heads screwed on right and pay attention to how crooked these people are. The time has come for us to all start to work together to defeat these guys. Libs, Dippers, Greenies: do what’s right for Canada and get your heads out of your butts. Withdraw candidates from loser ridings, form a coalition, do anything you can to protect Canada from these criminals. The heartless and cruel tragedy in Lac Megantic, Quebec reflects the complete failure of all Canadian stakeholders to understand that the time has come to reduce and/or eliminate rail traffic from the centre of our towns. We no longer live in an age when trains are the lifeblood of our society. Trains used to come through towns before towns got bigger. They actually bordered towns, but towns (mostly through bad planning and refusal to seek intensification) grew around them. Trains used to deliver goods to thousands of stops, to millions of consumers. This is no longer the case. They now use their economic and political leverage to ensure an ever-lasting ‘path of least resistance’ mentality. Lac Megantic reflects a shameful misdirection when it comes to the transport of all dangerous commodities in North America. Thomas Mulcair is correct in asking for more insight into whether or not there are regulatory and safety monitoring concerns. How dare the Conservatives and their media attack dogs suggest that this is political grand-standing. This is gutless and cowardly beyond reproach and they should be ashamed by their response. More importantly, they should cringe when their liar leader is posing for pictures for the media the instant they can get close enough. Unfortunately, the first question most people are waking up asking this morning is “why aren’t we transporting more of this stuff by pipeline?” (provoked mostly by our moronic media that are falling for the PR from Big Oil which is asking for massive pipelines to dot our landscapes). I beg to suggest that this is the wrong question. Unfortunately, we won’t ask those question in any serious way because for most of our politicians, one tragedy (and the prospect of many more) does not outweigh the financial cost of doing the right thing and making an investment in the future rather than preserving a poorly planned past. The right thing would be to develop and invest in a national (or international) renewable energy program that would drastically reduce our demand for Tar Sands products and oils from fracking (in the case of Lac Megantic, the oil was from North Dakota, where fracking is a massive overnight business). Next, we need to ask why more processing isn’t happening at source, again minimizing the volume of hazardous materials that are transported across the continent. Finally, it would be appropriate thing to sit down with our rail carriers and demand that they provide a coherent plan for reducing the volume of rail traffic that sails through our towns EVERY SINGLE DAY. If they don’t, they’re done. They forfeit any right to transport materials within a certain distance of Canadians. Get started. The first political party that latches on to these ideas – be they municipal, provincial or national – definitely get my vote. If our politicians don’t leverage these events to get better living conditions for all Canadians, expect more tragedies to occur. Rail volume is increasing, regulation has decreased, and age is wearing through the safety of all hardware. And that’s just from the superficial reports that we have from initial disclosures and documents. What does this tell us? There about 20 people in the PMO’s senior staff, at least according to Wikipedia. We see that already 3-4 of these people (15-20%) had knowledge of some kind of the payments to Duffy. These people represent significant points of communication that SHOULD have been happening between the staff and the Prime Minister. How much longer will Canada accept Stephen Harper’s line that he didn’t know anything? How is this possible? And as the connections become more intertwined, who will be left to throw under the bus? Stephen Harper must resign or the Conservative Party of Canada will never win a seat again because NO ONE will trust them.